By the age of 14 she achieved her first grade 8 distinction in clarinet and followed in the following year with three more for flute, saxophone and piano later completed diplomas in both flute and clarinet. She has been playing clarinet for 17 years with Ken Whiting and has studied with James Muirhead of Hallé Orchestra, Manchester. In more recent years studying with Joanna Patton and Mark O’Brian of CBSO, Birmingham and curently studying with Paul Sanders. Charlotte started her musical journey at the age of 11 attending Queen Mary’s Girls School on a music scholarship later attending Chethams School of Music. Prior to attending Chethams, she was a member of the Katabatic Wind-band and the Young Sinfonia at SAGE, Gateshead and played regularly with Yorchestra, NYSSO NYSWB, NYSCB and DDYO. Charlotte has performed three times at Edinburgh Festival as principal clarinet and pianist whilst playing with the Darlington and Dales Youth Orchestra. Charlotte has also performed with CSO as principal clarinet and bass clarinet often performing at Bridgewater Hall, Manchester as well as being performing at Band on the Wall, Manchester several times in Chethams Big-band. Charlotte graduated from Birmingham Conservatoire playing Clarinet, bass clarinet and flute in the Symphony orchestra and wind orchestra. Across these years playing in Carmen, Il Trittico, Swan Lake, A Little Night's Music and Sweeney Todd. 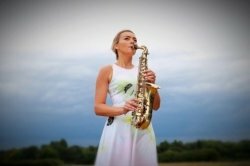 Charlotte's main ambition now, having a keen interest in music from the shows, is to become a successful west-end doubler using the skills of playing clarinets, saxophones and flutes playing in shows and also doing session-work. Frequently playing in shows across London and surrounding areas such as Westside Story, Oliver, Spamalot and Made in Dagenham. More recently Charlotte has been playing with London Musical Theatre orchestra recently performing Alan Menkin’s Christmas Carol at the Lyceum Theatre. Alongside Charlotte's other playing commitments she has a great passion for teaching running Charlottes Music School in Harpenden and currently teaches at Harpenden Musicale at St Georges School and as with a large number of private pupils in and around Harpenden and St Albans. Lessons are delivered with a view of achieving good technique but also having fun at the same time.